November is National Diabetes Awareness Month. In the United States, more than 100 million people are living with diabetes or prediabetes; that’s nearly 1 out of every 11 people with diabetes, with 1 out of 4 unaware they have the condition. Awareness of the disease cannot only prevent future cases for those at risk, but also help raise funds to develop new treatments for those living with diabetes. Being physically active less than three times per week. Race and ethnicity also can affect one’s risk. African Americans, Hispanic/Latino Americans, American Indians, Pacific Islanders, and some Asian Americans are at particularly high risk for type 2 diabetes. Preventing type 2 diabetes can be as easy as eating healthy food such as fruits, vegetables, and whole grains; staying physically active; and stop (or don’t start) smoking. These methods are also used to manage diabetes once diagnosed, along with testing your blood sugar and taking medicine/insulin as prescribed. Insulin therapy was developed and patented in 1923. The team of Canadian researchers intentionally set the price of the patent at only $3—$1 for each member of the team—to ensure that the life-saving treatment would be widely available and affordable for those who needed it. Despite the intentions of the developers, several pharmaceutical companies were indicted in an insulin price-fixing scheme in 1941. Insulin prices have steadily increased since synthetics were developed in the 1970s, leading to a billion-dollar industry. The increasing costs of insulin can be fatal to those with diabetes. The price of insulin in the U.S. has more than doubled since 2012, costing upwards of $1300 a month without insurance. 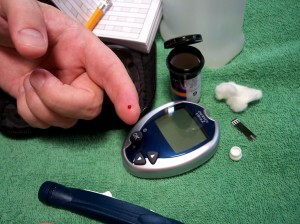 Twenty-five percent of diabetes patients admit to rationing insulin—using less than necessary to make it last longer. Rationing insulin can lead to lethal diabetic ketoacidosis—when your blood sugar becomes so high that your blood becomes acidic, your cells dehydrate, and your body stops functioning. The NeedyMeds’ Patient Assistance Programs (PAPs) database has programs offered by pharmaceutical companies that provide medication at low- or no cost for those who qualify. There are also coupons and our Drug Discount Card for those unable to use or find a PAP. The card can also be used for purchasing diabetes supplies, such as glucose meters, strips and lancets, as long as they are written like a prescription. There are also many national and local resources for those with diabetes in our Diagnosis-Based Assistance area of our site. All of our information is available for free on our website or through our toll-free helpline at 1-800-503-6897.